Category: Body Care. Tags: anatomicals, body care, fake tan, spray tan. Tarzan, the ape man, 1932. tarzan and his mate, 1934. tarzan escapes, 1936. and tarzan’s new york adventure, 1942. (not a great one). they were all black and white, so if T and J were pale, who knew? real life always has been and continues to be lived in colour. more than ever, people want that golden Hollywood glow. so now just as fake, but every bit as convincing as a movie set, comes out our spray tan. ready for your close up? yep, even right up close, your tan looks like the genuine article. 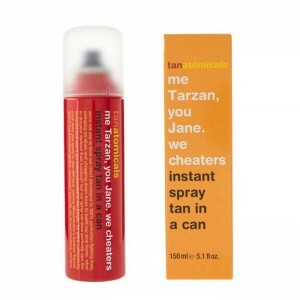 Anatomicals Tanatomicals Me Tarzan You Jane We Cheaters is an instant spray tan in a can. An instant spray tan in a can. Gives an instant colour while the tan develops underneath. Erythrulose and DHA for longer lasting and deeper colour development. Added with moisturisers to leave the skin feeling great. Quick and easy to apply and maintain. Anatomicals Tanatomicals Me Tarzan You Jane We Cheaters gives an instant colour while the tan develops underneath. It contains Erythrulose and DHA for longer lasting and deeper colour development. This instant tan has added moisturisers to leave the skin feeling great. The Anatomicals Tanatomicals are suitable for an active lifestyle and are quick and easy to apply and maintain.